Eighty-six catalogues (sizes vary), as issued in publisher’s wrappers. - A good run, including eight catalogues in the larger format (black, or green covers) used for presentation of more valuable stock. ¶ Wrappers of the older catalogues lightly rubbed, very few pencil or ink annotations; generally in good, fresh condition. (25 cm),  pp., illustrations. 62 items; priced. Publisher’s printed black wrappers. - Includes (item 1, £2600) the Liechtenstein copy of Spiegel menschlicher behaltnuss (Augsburg: Anton Sorg, 1476), acquired from H.P. Kraus (Catalogue 60, 1960); and (item 19) the Wilfred Scawen Blunt copy of Besler’s Hortus Eystettensis (1613), from Sotheby’s (sale 30-31 October 1961, lot 50). ¶ Wrappers rubbed; a clean copy. (25 cm),  pp., illustrations (some in 2 colours). 121 items. Price list inserted. Publisher’s printed black wrappers. - An exceptional catalogue, presenting forty incunables, including the 1498 Aldine Aristophanes, 1495-1498 Aldine Aristotle, 1477 Dante (ex-Hopetoun Library), 1472 Jenson Pliny, 1479 Milan Sallust (ex-Sunderland Library), the only known copy of Auctores octo (Lyon: Printer of Guido, “Casus longi”, c. 1487, ex-Sunderland Library; now Cambridge UL, Inc. 5.D.2.40 ), with pride of place (item 54, £5750) to the 1482 Caxton Polychronicon (ex-Frederick Perkins, and Earl of Warwick). ¶ Wrapper spine abraded; a clean copy. (25 cm),  pp., including XXV plates, illustrations. 325 items; priced. Publisher’s printed wrappers. - Among many fine books is the 1542 four-volume Blado Eustathius bound alla greca and ornamented with the arms of Pope Julius III (item 29). A “fine and important collection” of Baskerville imprints is dispersed (items 95-134). ¶ Occasional annotation in pencil; otherwise a very good copy. (21 cm), 42 (2) pp., illustrations. 302 items; priced. Publisher’s printed wrappers. ¶ Light stain on upper cover. [Stock catalogues, numbered series: 91] A Catalogue of catalogues of English sales libraries and booksellers from the eighteenth century to the present day. (21 cm), 30 (2 blank) pp. 305 items; priced. Publisher’s printed wrappers. ¶ Unmarked copy. (21 cm), 80 pp., illustrations. 479 items; priced. Publisher’s pictorial wrappers. ¶ Unmarked copy. (25 cm), 61 (3) pp., illustrations. 90 items; priced. Publisher’s printed black wrappers. - The unidentified “Library of a nobleman” was located by the editor of The Book Collector “not a hundred miles from Chipping Sodbury” (volume 31, 1982, p.362). 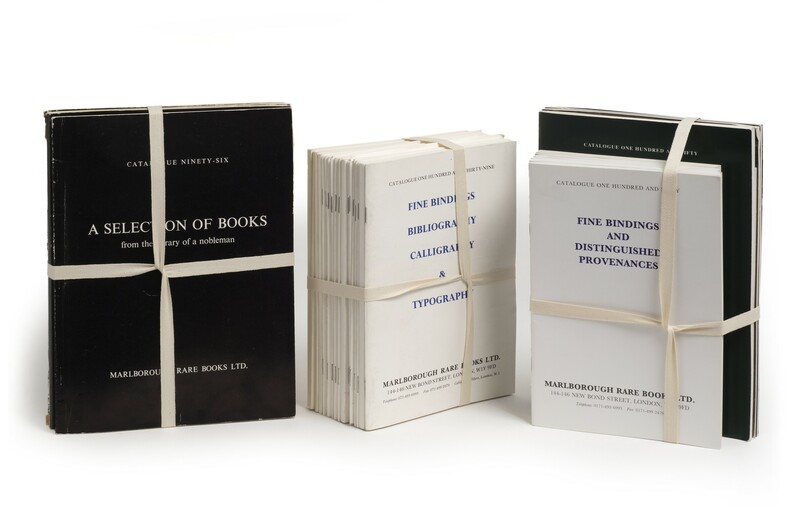 More books from the same source (”a final selection”) were offered in Marlborough’s Catalogue 107 (1984). ¶ Spine lightly rubbed; unmarked copy. (21 cm), 92 pp., illustrations. 564 items; priced. Publisher’s pictorial wrappers. ¶ Unmarked copy. (21 cm), 80 pp., illustrations. 420 items; priced. Publisher’s pictorial wrappers. ¶ Unmarked copy. [Stock catalogues, numbered series: 102] Illustrated books and books on the fine and applied arts. (21 cm), 84 pp., illustrations. 525 items; priced. Publisher’s pictorial wrappers. ¶ Annotation in ink on upper cover. (21 cm), 68 pp., illustrations. 400 items; priced. Publisher’s printed wrappers. ¶ Unmarked copy. (21 cm), 56 pp. 345 items; priced. Publisher’s printed wrappers. ¶ Unmarked copy. (21 cm), 32 pp. 164 items; priced. Publisher’s pictorial wrappers. ¶ Unmarked copy. (21 cm), 44 pp. 198 items; priced. Publisher’s printed wrappers. ¶ Unmarked copy. (21 cm), 16 pp., 1 illustration. 60 items; priced. Publisher’s printed wrappers. ¶ Unmarked copy. (21 cm), 28 pp. 175 items; priced. Publisher’s printed wrappers. ¶ Unmarked copy. (21 cm), 60 pp., illustrations. 336 items; priced. Publisher’s pictorial wrappers. ¶ Unmarked copy. (21 cm), 72 pp., illustrations. 392 items; priced. Publisher’s pictorial wrappers. ¶ Unmarked copy. (21 cm), 78 (2) pp., illustrations. 384 items; priced. Publisher’s pictorial wrappers. - The Irish bindings (items 51-72) are presented in chronological order (1711-1911). ¶ Unmarked copy. [Stock catalogues, numbered series: 133] Books with illustrations, sets of prints and a few drawings from the Sixteenth to the Twentieth Century. (21 cm), 20 pp. 105 items; priced. Publisher’s printed wrappers. ¶ Unmarked copy. (21 cm), 32 pp. 155 items; priced. Publisher’s printed wrappers. ¶ Unmarked copy. [Stock catalogues, numbered series: 136] Fine bindings, bibliography, calligraphy & typography. (21 cm), 44 pp. 264 items; priced. Publisher’s printed wrappers. 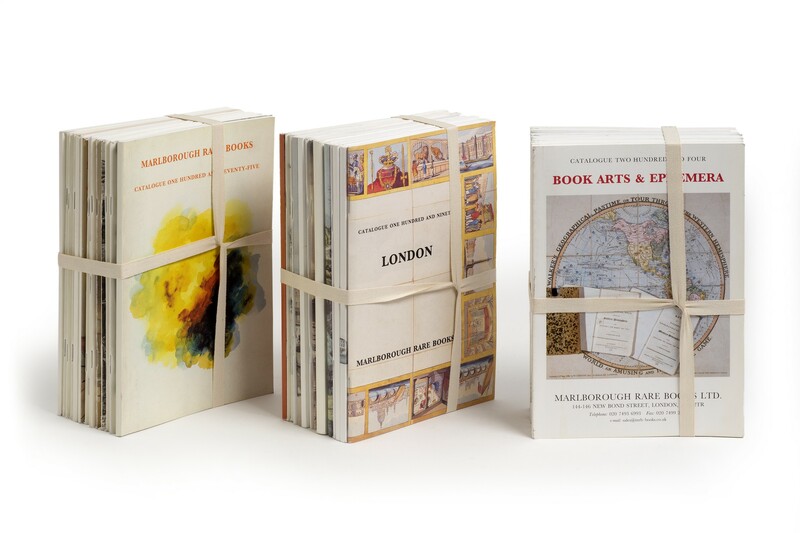 - Inserted leaf: “Jonathan Gestetner and Guy Naggar have purchased all the shares in Marlborough Rare Books Ltd. Alex Fotheringham remains as Director. Michael Brand is staying on as Consultant”. ¶ Unmarked copy. (21 cm), 28 pp. 125 items; priced. Publisher’s pictorial wrappers. ¶ Unmarked copy. (21 cm), 98 (2) pp., illustrations.525 items; priced. Publisher’s pictorial wrappers. ¶ Ink inscription inside upper wrapper; otherwise a clean copy. 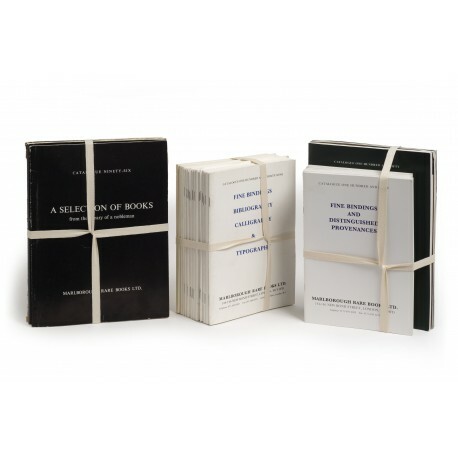 [Stock catalogues, numbered series: 139] Fine bindings : Bibliography, calligraphy & typography. (21 cm), 44 pp., 1 illustration. 233 items; priced. Publisher’s printed wrappers. - Irish bindings (items 1-7), including the folio 1745 Albrizzi Tasso bound in crimson morocco by the “College Binder”. ¶ Unmarked copy. (24 cm), 38 pp., illustrations. 76 items; priced. Publisher’s printed black wrappers. ¶ Wrapper creased; otherwise a fine copy. (21 cm), 16 pp. 109 items; priced. Publisher’s printed wrappers. ¶ Unmarked copy. (21 cm), 36 pp., illustrations. 302 items; priced. Publisher’s pictorial wrappers. ¶ Unmarked copy. (24 cm), 42 pp., illustrations (some in colour). 106 items; priced. Publisher’s printed green wrappers. ¶ Unmarked copy. (24 cm), 58 pp.,  p. of plates, illustrations (some in colour). 87 items; priced. Publisher’s pictorial wrappers. - Includes books bound in Paris for Thomas Wotton (items 7, 11), Paolo Giordano Orsini (8), François d’Anjou (19), Henry IV (28), and perhaps François de Coligny (22); books bound in Rome for “G.A.C” (1), an unidentified collector using the motto “Quo fata trahunt / Retrahuntque sequamur” (14), and for two members of the Parthenopean Academy (24); a book bound in Bologna for “Marco Anotimo” (3); books bound in England for Robert Dudley (4), the “Wizard” Earl of Northumberland (17), Sir Robert Harley (26), James I (30, 32). Some of these are re-offered in Catalogue 160 (1995). Noticed in The Book Collector, Autumn 1992, p.361. ¶ Unmarked copy. (21 cm), 68 pp., illustrations. 304 items; priced. Publisher’s pictorial wrappers. ¶ Unmarked copy. (24 cm), 68 pp., illustrations. 175 items; priced. Publisher’s green printed wrappers. - Includes (addendum - A) Charles Cameron’s The Baths of Romans explained (London 1772) in a Russian red morocco binding with the author’s arms; and (addendum - B) a miscellany of verse by an otherwise unknown Caroline poet, William Holloway (1614-c. 1663). ¶ Unmarked copy. (21 cm), 40 pp., illustrations. 212 items; priced. Publisher’s pictorial wrappers. ¶ Unmarked copy. (21 cm), 68 pp., illustrations. 251 items; priced. Publisher’s printed wrappers. ¶ Annotations in ink on title-page and in some margins. (21 cm), 40 pp. 216 items; priced. Publisher’s pictorial wrappers. ¶ Unmarked copy. (21 cm), 60 pp. 315 items; priced. Publisher’s pictorial wrappers. ¶ Unmarked copy. (21 cm), 60 pp. 223 items; priced. Publisher’s printed wrappers. ¶ Unmarked copy. (21 cm), 48 pp., 1 illustration. 236 items; priced. Publisher’s pictorial wrappers. - Includes (addendum - A) a collection of ephemera relating to public entertainments in London, assembled in the 18th century by John Henry Mauclerc (price on application); it is re-offered in Catalogue 169 (1997). ¶ Unmarked copy. (21 cm), 88 pp. 362 items; priced. Publisher’s printed wrappers. - Includes (item 185, £55,000) a copy of Samuel Johnson’s London: a poem (1738), bound with nineteen other books of poetry. ¶ Unmarked copy. (21 cm), 62 pp., 1 illustration (cover). 326 items; priced. Publisher’s pictorial wrappers. - Includes (addendum - A, £60,000) Roger Hallett’s vast painted Panorama of Bath (1983-1987), formerly exhibited in Bath, on London’s South Bank and at the Thames Barrier. ¶ Unmarked copy. (21 cm), 48 pp.265 items; priced. Publisher’s printed wrappers. ¶ Unmarked copy. (21 cm), 28 pp., 2 leaves of plates. 88 items; priced. Publisher’s printed wrappers. - Contains “two elegant French sixteenth-century bindings, one like Mahieu’s bindings, the other like Duodo’s though with monograms that may indicate François de Coligny. There was also a Jerome Epistolae 1602 with Henri’s IV’s arms, and four good English bindings” (from a notice in The Book Collector, Summer 1995, p.249). Also featured are a pseudo-Canevari binding forged by Vittorio Villa and some bindings unsold from Catalogue 146 (1992). ¶ Unmarked copy. (21 cm), 92 pp., illustrations. 426 items; priced. Publisher’s pictorial wrappers. ¶ Unmarked copy. (21 cm), 52 pp., 1 illustration (cover). 276 items; priced. Publisher’s pictorial wrappers. ¶ Unmarked copy. (21 cm), 52 pp., 1 illustration (cover). 271 items; priced. Publisher’s pictorial wrappers. ¶ Unmarked copy. (21 cm), 72 pp., illustrations. 268 items; priced. Publisher’s pictorial wrappers. ¶ Unmarked copy. (21 cm), 112 pp., 1 illustration (cover). 540 items; priced. Publisher’s printed wrappers. ¶ Unmarked copy. (21 cm), 92 pp. (pp.73-76 are misbound), illustrations. 335 items; priced. Publisher’s pictorial wrappers. ¶ Title-page annotated in ink; a few annotations in margins. (21 cm), 72 pp. 334 items; priced. Publisher’s pictorial wrappers. ¶ Unmarked copy. (13.5 cm),  pp., illustrations (in colour). 83 items; priced. Pictorial self-wrappers. - “Most of the almanacks listed in this catalogue were printed in Paris in the early 19th century” (Preface). ¶ Unmarked copy. (21 cm), 62 pp., 1 illustration (cover). 274 items; priced. Publisher’s pictorial wrappers. - Illustrated on the cover (item 4, £9000) is a Nuremberg binding bound in the Italian style for a member of the Römer family (Alciati, Emblematum liber, Lyon 1549). The 18th-century collection of ephemera offered en bloc in Catalogue 156 is here sold piecemeal (items 232-265). ¶ Unmarked copy. (21 cm), 52 pp., 6 colour illustrations. 195 items; priced. Publisher’s pictorial wrappers. ¶ Unmarked copy. [Stock catalogues, numbered series: 171] Books on the fine and applied arts including costume, guide books and catalogues of public and private collections, sales, etc. (21 cm), 66 pp., illustrations (some in colour). 297 items; priced. Publisher’s pictorial wrappers. ¶ Unmarked copy. (21 cm), 62 pp., 1 illustration (cover). 299 items; priced. Publisher’s pictorial wrappers. ¶ Annotations on index page; a few marks in margins. (21 cm), 68 pp., 1 illustration (cover). 357 items; priced. Publisher’s pictorial wrappers. ¶ Unmarked copy. (21 cm), 68 pp., illustrations. 248 items; priced. Publisher’s pictorial wrappers. - Includes (addendum, £13,500) Makhaev’s engraved views of the palaces in the environs of St Petersburg. ¶ Ink annotation beside one item. (21 cm), 84 pp., illustrations (1 in colour). 380 items; priced. Publisher’s pictorial wrappers. ¶ Unmarked copy. (21 cm), 100 pp., illustrations (some in colour). 440 items; priced. Publisher’s pictorial wrappers. ¶ Annotations in pencil on title-page. (21 cm), 44 pp., illustrations (some in colour). 168 items; priced. Publisher’s pictorial wrappers. - Includes (item 57) a 1639 probate inventory of Ingatestone Hall, Essex (now Yale University, Beinecke Library, Osborn b344). ¶ Unmarked copy. (21 cm), 60 pp., illustrations. 249 items; priced. Publisher’s pictorial wrappers. ¶ Unmarked copy. (21 cm), 76 pp., illustrations (some in colour). 287 items; priced. Publisher’s pictorial wrappers. - Includes (item 139) a complete copy of Owen Macswiny’s Tombeaux (1741). ¶ Ink annotations on title-page; several marks in margins. (21 cm), 88 pp., illustrations (some in colour). 362 items; priced. Publisher’s pictorial wrappers. ¶ Unmarked copy. (21 cm), 92 pp., illustrations (some in colour). 369 items; priced. Publisher’s pictorial wrappers. ¶ Unmarked copy. (21 cm), 68 pp., illustrations. 217 items; priced. Publisher’s pictorial wrappers. ¶ Unmarked copy. Two volumes (21 cm), I: 64 pp., illustrations (some in colour). 266 items and 4 unnumbered addenda; priced. II: 64 pp., illustrations (some in colour). 518 items; priced. Publisher’s pictorial wrappers. ¶ Unmarked copy. (21 cm), 124 pp., illustrations (some in colour). 426 items; priced. Publisher’s pictorial wrappers. - “This catalogue represents the final disposal from the once famous library at Hurstbourne Park, Hampshire” (Introduction). Many books contain the exlibris of John Wallop (1690-1762), 1st Viscount Lymington and later 1st Earl of Portsmouth; others the exlibris commissioned by the 8th Earl, in 1927. ¶ Ink annotations on title; a few marks in text. (21 cm), 72 pp., illustrations (some in colour). 256 items; priced. Publisher’s pictorial wrappers. ¶ Unmarked copy. (21 cm), 104 pp., illustrations (some in colour). 426 items; priced. Publisher’s pictorial wrappers. ¶ Unmarked copy. (21 cm), 68 pp., illustrations (some in colour). 257 items; priced. Publisher’s pictorial wrappers. ¶ Unmarked copy. (21 cm), 88 pp., illustrations (some in colour). 326 items; priced. Publisher’s pictorial wrappers. ¶ Unmarked copy. (21 cm), 104 pp., illustrations (some in colour). 386 items; priced. Publisher’s pictorial wrappers. ¶ Unmarked copy. (21 cm), 68 pp., illustrations (some in colour). 282 items; priced. Publisher’s pictorial wrappers. ¶ Unmarked copy. (21 cm), 108 pp., illustrations (some in colour). 360 items; priced. Publisher’s pictorial wrappers. ¶ Unmarked copy. (21 cm), 108 pp., illustrations (some in colour). 403 items; priced. Publisher’s pictorial wrappers. ¶ Unmarked copy. (21 cm), 116 pp., illustrations (some in colour). 363 items; priced. Publisher’s pictorial wrappers. ¶ Unmarked copy. (21 cm), 64 pp., illustrations (some in colour). 222 items; priced. Publisher’s pictorial wrappers. - Includes (item 112) Owen Macswiny’s Tombeaux (1741), containing proofs of intended letterpress and a variant title-page (compare copy offered in Catalogue 179). ¶ Unmarked copy. (21 cm), 64 pp., illustrations (some in colour). 186 items; priced. Publisher’s pictorial wrappers. ¶ Unmarked copy. (21 cm), 112 pp.,  leaves of colour plates, illustrations. 404 items; priced. Publisher’s pictorial wrappers. ¶ Unmarked copy. (21 cm), 80 pp., illustrations (some in colour). 238 items; priced. Publisher’s pictorial wrappers. ¶ Unmarked copy. (21 cm), 124 pp., illustrations (some in colour). 361 items; priced. Publisher’s pictorial wrappers. ¶ Unmarked copy. [Stock catalogues, numbered series: 199] Art, architecture, and allied arts, etc. (21 cm), 84 pp., illustrations (some in colour). 293 items; priced. Publisher’s pictorial wrappers. ¶ Unmarked copy. (21 cm), 128 pp., illustrations (some in colour). 407 items; priced. Publisher’s pictorial wrappers. ¶ Unmarked copy. (21 cm), 112 pp., illustrations (some in colour). 282 items; priced. Publisher’s pictorial wrappers. ¶ Ink annotations on upper cover. (21 cm), 112 pp., illustrations (some in colour). 360 items; priced. Publisher’s pictorial wrappers. ¶ Unmarked copy. (21 cm), 124 pp., illustrations (some in colour). 512 items; priced. Publisher’s pictorial wrappers. ¶ Unmarked copy.